A chic design of fashionable flare delivered with this 3-piece sectional sofa covered in a smooth but functional fabric. The lower portion trimmed with polished nickel studs and the seating is of pure, plush comfort. This platform framed sectional also features short wooden legs, accent stitching, and a matching ottoman. Enjoy easy cleaning and lasting durability with the high-grade Linen-Like Fabric. The set included two free accent pillows. 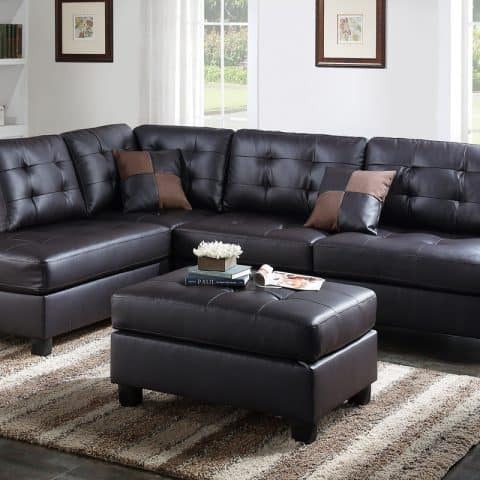 Built for function and style, this sleekly designed 3-piece sectional features units upholstered in rich-hued faux leather and accent tufting with light stitching. If you like ultra contemporary décor, indulge with a sectional that suits your desires. It also includes a matching cocktail ottoman. 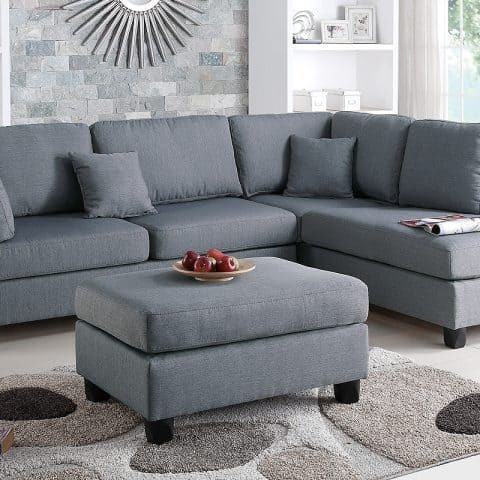 Experience simplicity with this 3-piece sectional with a matching ottoman. The upholstered in a plush linen-like fabric, this sectional features cushioned pillow back and seat supports for maximum comfort, and works perfectly in a contemporary or classic styled living room.